Marketing Automation is not a strategy. Too often marketers allow their technology to dictate their strategy, instead of leveraging technology to support it. Every company is unique, and cookie-cutter implementations are doomed to fail before you even send your first email or launch your first nurture program. 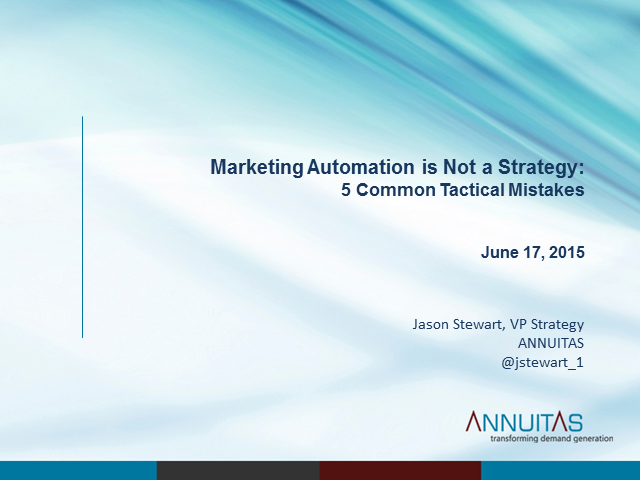 Jason Stewart, VP of Strategy at B2B Demand Generation Strategy firm ANNUITAS, will share some of the most common mistakes made in marketing automation implementations and offers advice on how to make your technology serve your strategy (instead of the other way around). The story of the ever-widening marketing skills gap is getting old. Especially when there are so many amazing options to obtain new skills training both online to off-line. Why aren't marketers taking advantage of all there is to offer? Time? Money? Your day job? Unsure of areas of specialization to focus on? Enough excuses. Content is KING, marketing automation is here to stay and big data, analytics, SEO and demand generation are only going to get more complex as new technologies are introduced and our buyers gain sophistication. Marketers must continue their educations - the time for marketing enablement is now. It's time for marketers to address our skills gap-it's now or never. Let the learning begin. Marketers struggle to address the ever-widening skills gap as organizations simply don't focus on marketing enablement and universities don't prepare students for life in the marketing fast lane. It's time for marketers to focus on their own enablement, but where to begin?